Bob Schnieders has been with the firm since shortly after the founding in June of 1991. He handles a wide variety of cases and has expertise in several areas of practice. Bob handles all of the firms worker's compensation case and all of the appeals. He spends the majority of his time handling all types of civil litigation, including personal injury cases, business litigation, construction cases, real estate cases, and contract disputes. He also handles traffic tickets and is the City Attorney for the cities of Concordia, Emma, Henrietta, Hardin and Corder, Missouri. 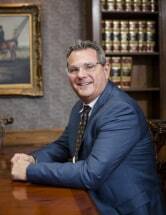 He is licensed in Missouri and Kansas and handles cases in a wide array of jurisdictions. Mr. Schnieders received his BA from Benedictine College in 1987 and his Juris Doctorate from UMKC in 1992 with distinction. He graduated in the top 2 of his law school class and was selected to the Order of the Bench and Robe and was a member of the Law Review. He was admitted to the Missouri Bar in 1992 and the Kansas Bar in 1993. He serves on the Board of Directors of the Eastern Jackson County Bar Association and the Eastern Jackson County Youth Court. He is a member of the Missouri Association of Trial Attorneys, Missouri Municipal Attorney Association and Lafayette County Bar Association.